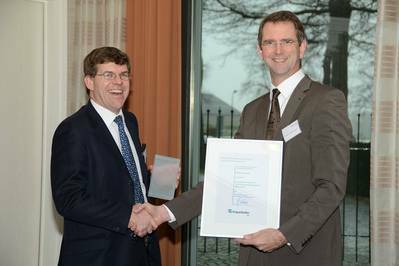 Rolls-Royce recognised as one of the best in Europe for 'Technology Management' by the Fraunhofer Institute for Production Technology. The 'Successful Practice Award' was presented recently at a ceremony held in Vaals, the Netherlands. Rolls-Royce, which has invested over £7.5 billion in the last ten years on Research and Development, was commended for its long-term strategic approach to technology development. Also highlighted were its network of University Technology Centres and Manufacturing Research Centres which act as both generators of technology and important recruiting grounds for talent. Rolls-Royce was identified as possessing a culture of openness, which incentivizes innovation, and an ability to identify and channel resources into successful technology. Some 160 companies participated in 2012/13, with five receiving awards following a rigorous screening and assessment process. Potential award winners were assessed on how well they organized their technology management, their forecasting of requirements and their planning and controlling of the development of new technology. The Fraunhofer Institute for Production Technology is part of the Fraunhofer-Gesellschaft, the largest organization for applied research in Europe with more than 80 research units, 22,000 staff and research centres and representative offices in Europe, USA, Asia and in the Middle East. The award itself is organized and run together with a consortium of world class European companies including Daimler, Bosch, and Miele.